Many-coloured spurge 'Midas' and cushion spurge 'Midas'. Flowers from spring to midsummer. Happy with any soil type or pH and in exposed or sheltered sites (of any aspect) including coastal conditions. 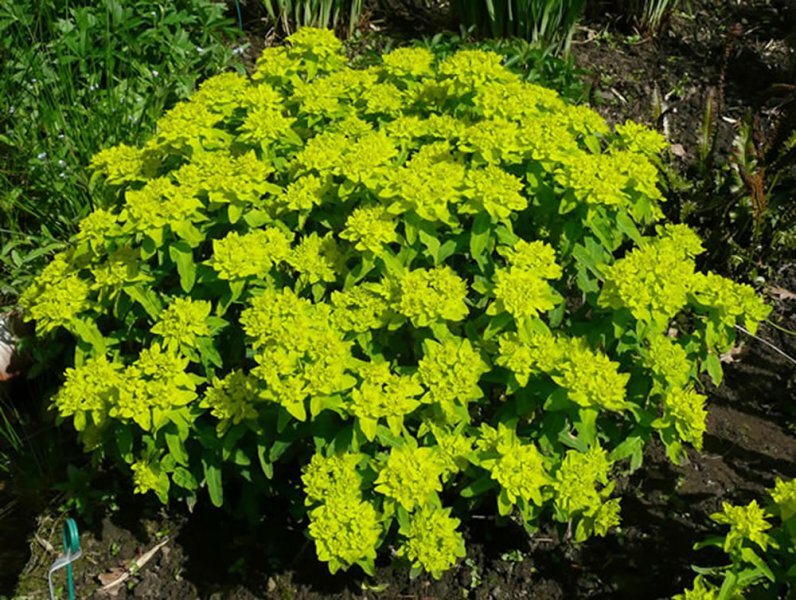 A compact mound of mid green foliage bears bright yellow flowers and bracts from spring. In autumn the foliage is tinged red. Great in beds and borders, particularly Mediterranean style planting schemes. Its low height makes it useful for ground cover. Good for low maintenance gardening, can be used in containers and will survive drought well. 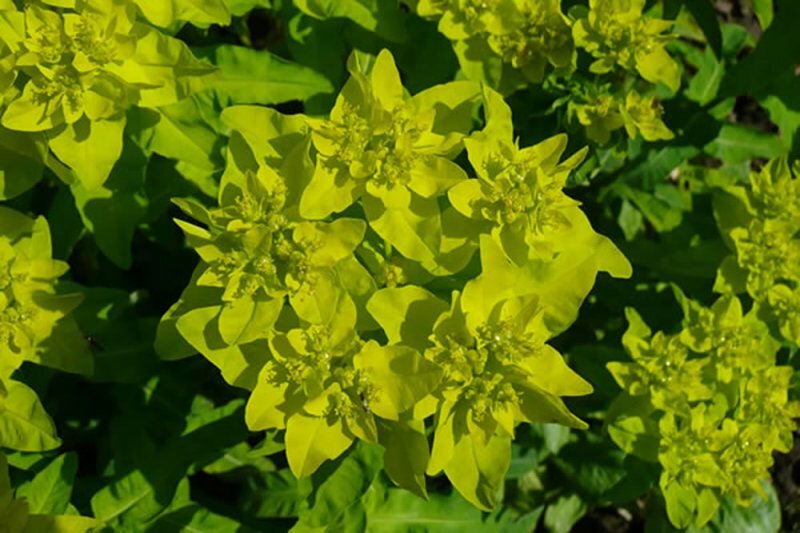 As with all euphorbias it is best to plant this away from the edge of paths, seating or children’s play areas as the sap can cause skin irritation. This euphorbia requires little looking after. Always wear gloves and a long sleeved shirt when working with euphorbias to protect yourself from the sap. Cut the flowered stems down to ground level after they have flowered, in late summer or early autumn. The simplest way to propagate this plant is by division. This should be done in late summer to early autumn once it has finished flowering. Seeds can be collected and sown in autumn to be exposed to winter cold, then germinating in spring. If sown in spring (which can be done at 15°C) the germination may be more erratic and happen over a period of several months. As this plant is a cultivar it may not come true to form from seed. Basal cuttings can be taken in spring or early summer. Alternatively, stem-tip cuttings can be taken in late summer/early autumn once flowering has finished. The cuttings should be up to 10cm in length and should be left for an hour before planting so that the sap drains out. Put the cuttings in a cold frame over winter, potting up singly after a month or so (once they’ve rooted) and planting out in spring. Generally this euphorbia is pest and disease free. The milky sap (“latex”) of euphorbias can irritate the skin, particularly in sunlight. All parts of the plant are toxic if ingested and the sap has carcinogenic properties. The genus Euphorbia is one of the largest and most varied, with 2,100 species which range from herbaceous annuals, to cacti-like succulents, to 20m high trees! Euphorbias can be traced back to Roman times when Pliny the Elder, in his book ‘Natural History’ (79AD), mentioned their use in treating an African king named Juba. He writes that Juba named the plant after his Greek physician Euphorbus, the name meaning ‘good fodder’ or ‘well fed’. One species of Euphorbia, E. regis-jubae, was named in honour of this king. The common name ‘Spurge’ derives from the old French ‘espurgier’ meaning to purge, as the sap of herbaceous euphorbias used to be used as a purgative (a laxative).